Antique brown 42 oz. 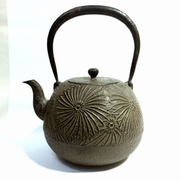 iron teapot WITHOUT enamel coating inside. 3" opening diameter and 5 3/4" height.